More fixes - we aren't complaining! • Added support for free-trial of Revolution DLC from 5/24-5/28. • Added support for Personalization Pack Community Voting. • Improved and expanded who can be the host of a game lobby. • Resolved an issue reported by the community where the reticle would sometimes disappear. • Addressed an issue reported by the community where the Peacekeeper would sometimes disappear after a host migration. • Addressed an issue reported by the community where the Scorestreak progress bar would not fill up. • Fixed an issue reported by the community where the ammo count for the Death Machine and War Machine would reset on round change. • Fixed the player’s character model shifting sideways slightly when the A10F Warthog makes a strafe run. • Addressed an issue with the Death Machine receiving the War Machine’s ammo. • C4 will no longer detonate when it touches the front of moving gondolas on Downhill. • Resolved a client freeze when the client continually scrolls Create-a-Class sets while the host of a party changes lobbies and brings the party with them. • Fixed an issue with sound and visual effects not working when a tactical insertion is destroyed by the sliding alien targets on Studio. • Addressed an issue with C4 not being destroyed by the sliding alien targets on Studio. • Resolved an issue with the player floating down slowly when re-spawning if their tactical insertion was placed on a ledge. • Fixed an issue with held Scorestreak weapons not reloading the current ammo upon death. • B23R Dual Wield: Damage reduced. • B23R Dual Wield: Hip fire accuracy reduced. • FHJ-18: Movement speed increased. • Resolved an issue with the Grief Leaderboards not updating properly on the first match completed. • Addressed several Zombie pathing issues found by the community. • Addressed an issue that caused Zombies to pile up on the planted Zombie Shield. • Fixed an issue where players could get more Blundergats than intended. • Addressed an issue where you could fall out of the Gondola into unplayable areas. • Addressed an issue where players could mantle into unplayable areas in the Cell House. • Addressed an issue in Grief Mode where players could push each other onto the top of the map in the cell house. • Fixed an issue where players would not receive grenades after a round change. • Fixed an issue where afterlife doors would not show up if you hot joined a game. • Fixed several theater mode issues where the free roam camera could clip out of the world. • Fixed an issue where all players in a co-op game could hear the “click” of an empty Ray Gun. • Addressed an issue where players could revive themselves and fall under staircases. • Fixed an issue where the Hell’s Retriever effects would sometimes vanish. • Fixed an issue where Zombies would not attack players crouched in corners. • Fixed an issue where players could fall through the map after being revived in the Infirmary. • Fixed an issue where random Afterlife markers would show up for players after the first plane trip. • Fixed an issue with Zombies getting stuck in the starting room on Die Rise. The latest patch is currently live, and will take effect the next time you start up the game. Call of Duty: Black Ops 2 is the latest installment in the long running series. It is available for all current generation consoles and PC. 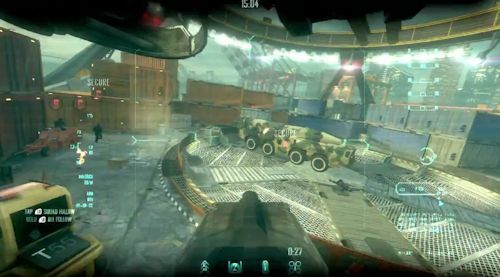 It supports cooperative play with up to four players online, and two players locally. Page created in 0.2859 seconds.